Houston Dental Implants (713) 464-2792 | Schedule Now! 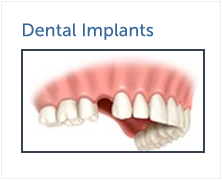 Contemporary Implantology, Inc. is a specialty dental practice located in Houston, Texas. 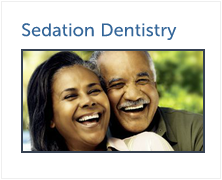 We focus on periodontics and dental implant surgery. We are committed and dedicated to enhancing your smile using conservative, state-of-the-art procedures resulting in beautiful, long lasting smiles! Dr. Shere is a Board Certified Dental Surgeon - why is this important? Other dentists send Dr. Shere dental patients from all over Houston, because Dr. Shere handles complex dental implants. There are nerve ending that can cause significant pain and suffering during dental implants - we specialize in comfort, taking exceptional care to ensure complex dental implants are planned and customized to each patient that we treat. Over 30+ general dentists in Houston, refer Contemporary Implantology (video testimonials) dental patients. When a general dentist asks you to find a periodontist - Contemporary Implantology - Houston Periodontitis - Board Certified Dentist in Houston should be your first choice. Specializing in COSMETIC IMPLANT DENTISTRY giving you back your amazing smile in comfort! Give us a call to discuss your dental needs - cosmetic surgery costs, dental implant costs and schedule a dental appointment. Contemporary Implantology, Inc. is a specialty dental practice located in Houston, Texas. 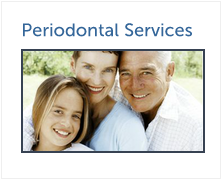 We focus on periodontics and dental implant surgery. We are committed and dedicated to enhancing your smile using conservative, state-of-the-art procedures resulting in beautiful, long lasting smiles! DISCLOSURE: FREE Consultation value $120, and CT scan fees range from $149 - $249 depending on how many sites are scanned. 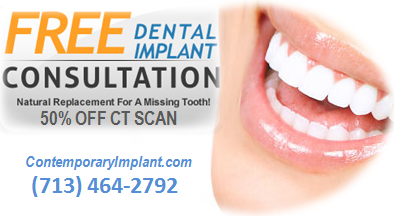 Free Implant Consultation with the purchase of X-rays.